After many days of sleep deprivation, our Spirit Tracks Walkthrough is now complete! Chapter 11 covers the Tower of Spirits Part 6 and the final chapter covers the Dark Realm. Additionally, work on formatting the second chapter, the Forest Realm has progressed a bit and now includes everything up until the Forest Temple. I’ve also put together a temporary page for all of the Spirits Tracks Stamp Stations. This is one of the collectible items found within Spirit Tracks. The guide includes all 20 locations, as well as the three prizes that Link can earn. 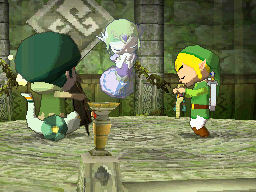 Check back at Zelda Dungeon as we will be editing our Spirit Tracks content over the next few days!